TIMING BELT KIT & DEPHASER PULLEY. Orders placed before 2:00pm will be dispatched that same day (Mon-Fri). 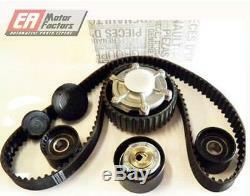 THIS LISTING INCLUDES: (OE Part Numbers) TIMING BELT KIT. DEPHASER PULLEY RENAULT - 8200782671 RENAULT - 7700108671 RENAULT - 8200539619. The item "GENUINE OEM RENAULT CLIO SPORT 2.0 172 182 DEPHASER PULLEY + TIMING BELT KIT" is in sale since Monday, March 26, 2018. This item is in the category "Vehicle Parts & Accessories\Car Parts\Engines & Engine Parts\Camshafts". The seller is "ea_motorfactors" and is located in Westcliff on Sea, Essex. This item can be shipped worldwide.